Palmetto state Armory is proud to announce our latest 9mm AR lower. Machined from Billet 7075 T6 forgings and then hard coat anodized, these lowers are purpose built to accept 9mm Glock®-style magazines. Designed to work with PSA's new 9mm Hybrid uppers. The lower is assembled with a Palmetto State Armory Pistol Lower Build Kit with a classic A2 Grip and PSA pistol buffer tube.. Item must be shipped to a valid FFL. Please enter your preferred FFL shipping info into the ship-to field at checkout. Please check your local laws before ordering. Not available for shipping to all areas. Palmetto State Armory is proud to announce our latest 9mm AR lower. Machined from Billet 7075 T6 forgings and then hard coat anodized, these lowers are purpose built to accept 9mm Glock®-style magazines. Designed to work with PSA's new 9mm Hybrid uppers. The lower is assembled with a Palmetto State Armory lower build kit with a classic A2 Grip and PSA pistol buffer tube..
when is this going to be back in stock , the upper i bought from you is lonely? Where are the compatible uppers? When I click the link I get a page that says oops!!!! What braces are compatible with this buffer tube? BEST ANSWER: Mine came with a standard pistol buffer tube and it's compatible with all pistol braces. The buffer tube in the picture shows grooves cut into it. Mine arrived with a standard tube and was smooth - which was preferred. Hope that helps. Great lower! Any kind of ar15 pistol brace. I have both the smooth and the ribbed tubes. Both have sb braces on them. I replaced the buffer tube with the Shockwave brace which comes with its own buffer tube. I used the KAK shockwave complete kit. Works and looks good with no looseness. Any of the sb tactical or the shockwave blade will fit. I use a Shockwave brace on mine. SB Tactical fits on mine. What is different on this lower that it has to be used with the PSA hybrid upper? BEST ANSWER: I’ve heard that it can be used with other 9mm uppers as well. PSA put that in the description so people who are new to the sport don’t by it and expect it to work with their ar-15 upper. I have a side charging QC 10 upper on mine, but am using the PSA hybrid BCG. I don’t believe the receiver matters, but the BCG does. What is unique about PSA’s hybrid 9mm bcg vs another company’s 9mm bcg? Nothing at all, they just fit well. All of my builds have my own upper build. I have had fit issues betweeother brands. I purchased both of them to complete an AR9. Found using uppers and lowers from same Manufaturer’s has best fit. Anyone know if this will this work with a delta team tactical upper?? Show you the uppers you should use. I appreciate that. But i already have the upper. I’m just looking for a lower to go on it. IT should work with an regular AR-15 upper. you can only use glock magazines with it. Thank you. Yes i am trying to do a 9mm glock build. But I just want to make sure this will work. The upper i got is a 9mm. Thanks again!!! Will this accept 50 rnd drum? BEST ANSWER: As long as the 50 rd drum is glock mag style yes this should accept it. Will this take glock 19 mags ? BEST ANSWER: Yes, g19, and longer magazines. Anyone know if I could put a a cqb stock from maxim defense on this lower? Incredibly fast shipping. Ordered on a Sat AM. Was at FFL on the following Tuesday AM. Maybe even Monday. Can’t remember. Received exactly what I ordered. Runs like a dream. Great bang for your buck. Very nice lower. Had features on it that I’ve only seen on a Danny D. They’ve done good with this one. I have just got back from the range. I have this lower with the PSA hybrid upper 7.5" w/UTG Pro fixed sights. FLAWLESS performance! This baby ate up 100 9mm like it was chocolate cake with ice cream. Easy to control very accurate sighted in a 25 shot high at 50 so I split the difference cut fifty cent piece sized holes at all ranges. Fires well right or left handed. Brass ejection solid and hard. The build of this and the upper are tight and excellent. You want one! Waiting on my SBR paperwork and then install a LWRC UCS! That will be perfection! Was skeptical at first but pulled trigger 2 weeks ago and purchased. Shot it today. MONEY WELL SPENT. PSA hit it out of the ball park with this one. No failures of any kind. Mated to a 7.5 in PSA upper and shot 1 ragged hole at 7 and 10 yards. Fit and finish were excellent. Excellent Craftsmanship & A Blast to shoot! I had been looking for a 9mm carbine for a while & finally "pulled the trigger" after much study and shopping. I don't think I could have made a better choice than I did by going with the PSA 9mm Billet Complete Classic Glock© Style Magazine Pistol Lower! It shipped Fast to my local FFL and was awesome right out of the box. It went together with my PSA 9mm Upper with ease & looked like a weapon that I would have & could have easily paid twice as much for! As with most gun enthusiast I took it straight to the range and tested it & tested it & tested it... Quit honestly I had perma-grin and could not stop shooting it. I have several weapons I take with me on my range excursions but this thing has a life of it's own!! It's the most fun I've had at the range in a long time! As a Glock guy which was the ultimate sales point for this lower being able to go from Pistol to carbine by grabbing the next G17 mag from my range box was AWESOME! Thank You to everyone at PSA for making this an excellent experience with an awesome product!! No last round hold open. Wish I would have researched first. very good quality and flawless function. Was able to put a few hundred rounds through the PSA G9 lower with the 10.5" upper with the KAK flash can. It ran without fail with glock 17rd and 33rd mags and magpul mags. As stated before the mag insertion is a little sticky but loosened up and can insert mags cleanly now without holding the mag release ( the release could use a slight chamfer on the leading edge to improve insertion ). Ejection was strong and feed flawless and would run very fast when asked. The gun is remarkably quiet to the shooter with the KAK flash can sounded a lot like a 22lr AR. The lower has some nice features such as the tension screw for the upper and the takedown and safety springs are retained in the lower. Am very happy with it will probably have to get a few more in different variations. As far as value this is a very nice G9 lower assembled for cheaper than the others stripped. This is a great product and my first purchase from PSA. I've shot it once already and it was a lot of fun! Very reliable. I wish they had done a billet upper to go with it. 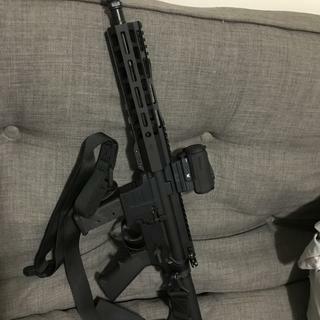 I bought this lower to hold for a couple of months before ordering the upper. As soon as it arrived I had to complete the project. (Beware it could be addicting) So another order to PA and the upper arrived. Added a pistol brace. Fit finish is excellent. Shot it a couple of days ago with the only 9mm I had available aluminum case blaser. fed it all with no issues. (Glock 31 OEM Mag) Highly recommend. Bought this along with a pistol length PSA 9mm upper (Sku 7781304) and ran several hundred rounds through it without any issues. Really high quality billet lower well put together and ran like a champ. I upgraded the grip to a soft Rock River Arms hogue copy I had lying around and added a SigTac Brace. Mag well is deep so beware that quick mag changes take practice vs a standard AR in .223. It's beveled but mags need to be inserted straight in. Trigger was standard milspec and breaks at a fairly heavy 7lbs. It has little to no creep and hardly any overtravel but it's definitely heavier than I prefer. I picked up a PSA EPT Enhanced Polished Fire Control Group and it looks like it should drop right in and give me 3-4lbs. Lower also comes with a QD sling mount end plate with slots. It's much appreciated but that design tends to dig into the webbing between my thumb and trigger finger when getting on it. Trigger guard is machined along with the billet block and is extremely beefy and oversized. Mag release was a little sticky on some mags but loosened up after a bunch of mag changes and a light oiling. Mags now drop free w/no probs. I used Glock 17 mags in standard (including Magpul) +2 and 33 round configurations and had no issues with any of them. Overall I am tickled with this lower and the pistol upper. Really accurate super fun ammo is anywhere from 10-25 cents less than standard .223 and a lot less boom means my wife and kids enjoy shooting it too. Thanks PSA for a really great quality product. I much prefer this over the AR lower using a 9mm conversion kit. No contest. The lower functioned flawlessly. I still hold the mag release button when inserting mags. This lower fits up nicely with the 10.5 pistol upper. With a little future mods on the mag well area this could be a 5 star. Good reliability and price make it a great value for a great looking and dependable ar9. I really liked the idea of a glock magazine ar. This one needs lots of reworking to become usable. My main issue is with the mag well. It isn't finished very smooth and the mags stick in it. It also has a mag retention device that blocks your ability to slide a mag in without pushing in the mag release button. I guess it it also a mag insert button now??? The retention device is a straight angle piece of metal that gouges the plastic lips of the glock mag if it were beveled on the underside the mag might slide in without using the button and damaging the glock mag. The mag release button is a little to far forward and you have to use to much force to depress it a lighter spring and adjusting the mag release device so it doesn't protrude so far into the mag well (so you don't have to fully depress the button all the way to the receiver) would definetly be an option to improve the current placement. I will see if I can update you more after putting some rounds through it.